This article is an excerpt from Professional Microsoft Office SharePoint Designer 2007 by Woodrow W. Windischman, Brian Phillips, and Asif Rehmani from Wiley Publishing (ISBN 978-0-470-28761-3, Wiley Publishing, Inc., 2009, all rights reserved). No part of these chapters may be reproduced, stored in a retrieval system, or transmitted in any form or by any means—electronic, electrostatic, mechanical, photocopying, recording, or otherwise—without the prior written permission of the publisher, except in the case of brief quotations embodied in critical articles or reviews. Microsoft Visual Studio 2008 (not Visual Studio Express). Windows SharePoint Services 3.0 SDK or Microsoft Office SharePoint Server 2007 SDK. Windows XP or Windows Vista. (I used Windows Vista.). I chose General Development Settings when configuring Visual Studio 2008 for the first time. If you chose different settings, your screens may differ from the screenshots in this chapter. If you want to reset your Visual Studio 2008 settings, select Tools > Import and Export Settings, and use the wizard to reset your settings. In the wizard, you have the option of backing up your existing settings if you want to revert to them later on. The built-in actions in Windows SharePoint Services are a good starting point for functionality to your workflows, but if you need functionality that these actions do not provide, you have to create a custom action. Once you have deployed a custom action to Windows SharePoint Services and configured it to run, it appears in the SharePoint Workflow Designer. This section provides an example in which you build a custom action to create child sites that can be called as a part of a SharePoint Designer workflow. Begin the process of creating a custom action by opening Visual Studio and selecting File > New > Project. The result is the New Project dialog, as shown in Figures 15-1 (Visual Basic) and 15-2 (C#). 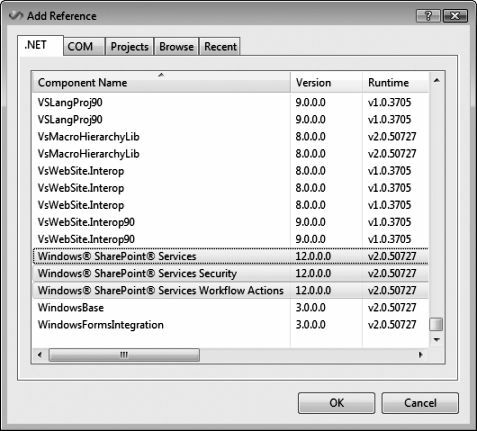 Ensure that .NET Framework 3.0 has been chosen from the dropdown list in the upper-right corner of the dialog. Do not choose .NET Framework 3.5 unless your server farm has been configured to support .NET Framework 3.5. A list of Project templates will be displayed on the right. 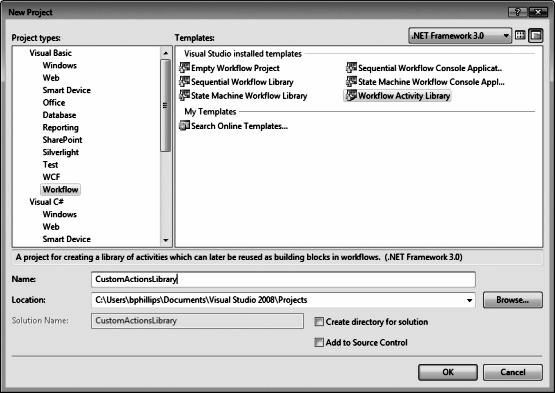 Choose the Workflow Activity Library template, and then enter a name (CustomActionsLibrary for this example) and location for the Project in the lower section of the dialog. Click OK, and the Project to contain your custom action is created, as shown in Figures 15-3 (Visual Basic) and 15-4 (C#). By default, Visual Studio automatically creates a file named Activity1.vb or Activity1.cs which you do not need. Remove the file by right-clicking Activity1.vb or Activity1.cs in the Solution Explorer window and selecting Delete from the context menu. A confirmation dialog appears. Click OK to confirm the deletion. Assemblies that contain custom actions must be strong-named to run inside Windows SharePoint Services. A strong name ensures that your assembly will not be mistaken for another assembly, even if both have the same name. To learn more about strong names, read the Strong-Named Assemblies article on MSDN. To configure the Project to have a strong name, right-click CustomActionsLibrary in the Solution Explorer window and select Properties to open the Project properties screen, as shown in Figures 15-5 (Visual Basic) and 15-6 (C#). Click the Signing tab, and click the Sign The Assembly check box. Select New from the Choose a strong name key file dropdown list to open the Create Strong Name Key dialog (see Figure 15-7). 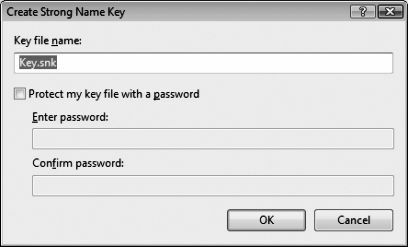 Enter Key.snk in the Key file name text box, uncheck the Protect my key file with a password check box, and click OK. Click the Save icon on the toolbar and close the Project properties screen. Release the Ctrl key, and click OK.
To create your first custom action, you must add an activity to the Project. Right-click CustomActionsLibrary in the Solution Explorer window, and select Add > New Item from the context menu. 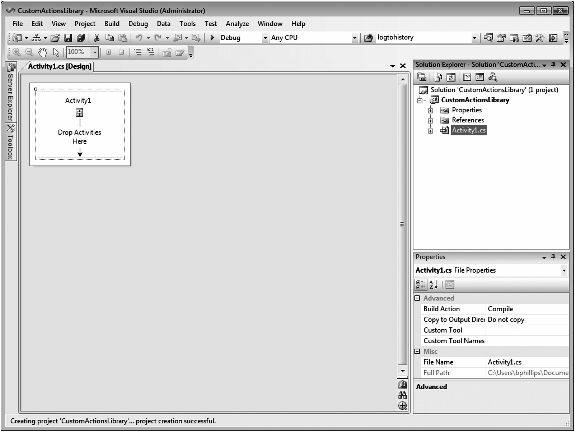 The Add New Item dialog opens (see Figure 15-9). 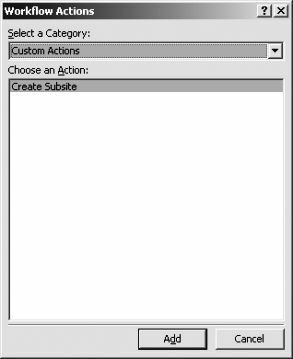 Choose Workflow from the Categories on the left, and select the Activity template from the list on the right, enter a suitable name for the action, and click OK. For this example, name your custom action CreateSiteAction. 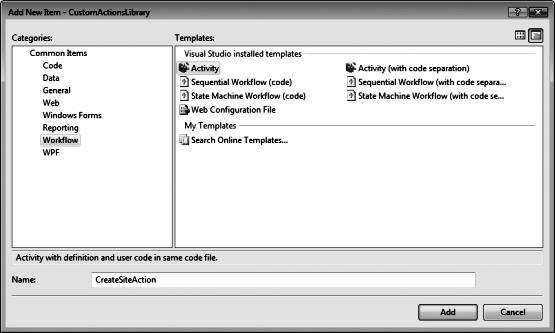 Now, you can start modifying this code to provide a mechanism that allows SharePoint Designer to provide values for your custom action before you add your custom functionality. This mechanism is called a property and is explained in detail in the next section. SiteUrl: Where the site will be located. SiteTitle: Title for the new site. SiteDescription: Description for the new site. SiteTemplate: Template to use to create the new site. InheritPermissions: True, if the new site will inherit permissions from its parent site. Now you can place your functionality inside the Execute function. Your custom action is now complete. Select Build > Build Solution, and fix any compilation errors that appear. The only thing that remains is to create an ACTIONS file that tells SharePoint Designer what to display in the workflow wizard when the user configures your action. The next section describes this process. <Action Name="Log to History List"
Zero or more FieldBind elements. Zero or more Parameter elements. 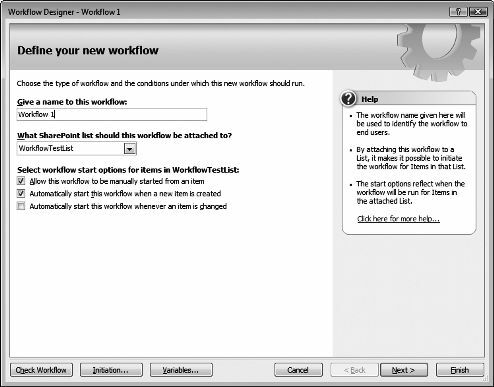 The Action element contains the location of the custom action, the name to display in the workflow wizard, and a category name that is used for filtering actions in the Workflow Actions dialog (see Figure 15-11). 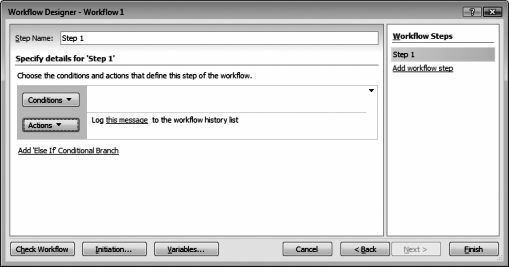 The Workflow Actions dialog is displayed when the user selects Actions > More Actions on the step configuration screen of the workflow wizard. The RuleDesigner element contains the sentence to display to the user and the replacement variables that will be bound to the action's properties. Replacement variables begin with a percent sign and are numbered starting with 1. In the preceding snippet, the sentence Log %1 to the workflow history list contains one replacement variable. The FieldBind element indicates the text to display in place of the replacement variable in the workflow wizard, the type of designer used to specify the value for the replacement variable, and the name of the Parameter element that will receive or store the value from the replacement variable. There will be one FieldBind element for every replacement variable. When the workflow wizard displays the Log to History Action, it will replace %1 with the value of the Text attribute of the FieldBind element, whose Id attribute has the value of 1. In this case, %1 will be replaced with "this message" since the FieldBind element has its Text attribute set to "this message" (refer to Figure 15-10). The Parameter element indicates which properties of the custom action will be configurable in the workflow wizard. For each FieldBind element, a Parameter element must be created so that its Name attribute matches the value of the Field attribute in the FieldBind element. It may be tempting to edit the WSS.ACTIONS file directly, but don't. If you edit the ACTIONS file incorrectly, no built-in actions will work in SharePoint Designer. Rather than modifying this file directly, you can create a new ACTIONS file to contain the information for your custom actions. This file is not required to be a part of the Visual Studio Project, but you can use Visual Studio or another XML editor to create it. This example uses Visual Studio. 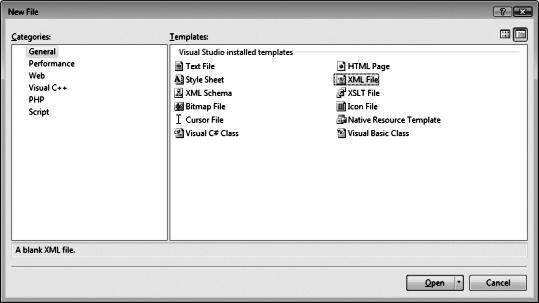 To create a custom ACTIONS file, open Visual Studio and choose File New File. The New File dialog opens (see Figure 15-12). 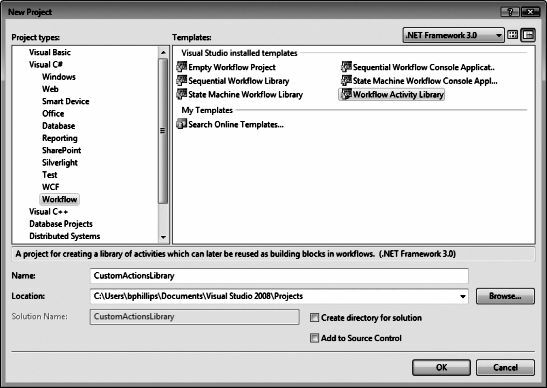 From this screen, choose General from the Categories on the left and select the XML File template from the list on the right. If it is not already open, open the Output window by selecting View > Output. 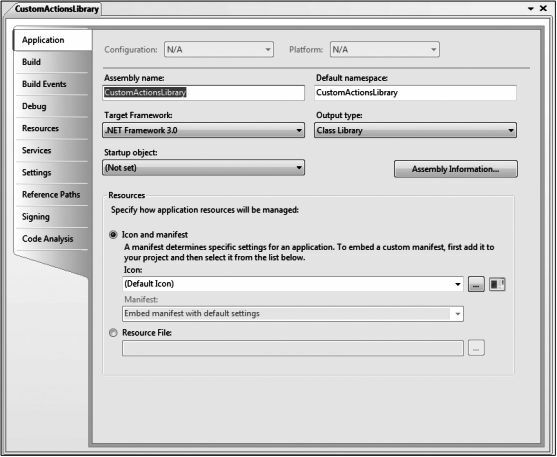 Build the custom action assembly by selecting Build > Build Solution. Open the Visual Studio Command prompt by clicking Start > All Programs > Microsoft Visual Studio 2005 (or 2008) > Visual Studio Tools Microsoft Visual Studio 2005 (or 2008) Command prompt. Type sn.exe–T assemblypath, where assemblypath is the location of the DLL from step 3. If assemblypath contains spaces, you must enclose it in quotation marks. Specify 1 through 5 for the Id attribute of the new FieldBind elements. Change the Type attribute of the Parameter element for the InheritPermissions property from "System.String, mscorlib" to "System.Boolean, mscorlib". <FieldBind Field="SiteTemplate" Text="site template" Id="4"
Save the ACTIONS file by selecting File > Save, entering custom.ACTIONS as the filename, selecting All Files from the Save as Type dropdown list, and clicking Save. Double-check the file extension of the saved ACTIONS file to ensure that it is ACTIONS and not XML. Now that the ACTIONS file has been created, you can deploy your custom action to SharePoint and test it. The next section details those steps. Add the assembly to the Global Assembly Cache. The Global Assembly Cache stores assemblies that are shared among server processes. Most SharePoint-related assemblies must be placed in the Global Assembly Cache before Windows SharePoint Services can use them. This restriction also applies to custom actions. However, placing assemblies in the Global Assembly Cache can be very dangerous, since these assemblies are accessible to the entire server farm and run without any restrictions on what code is allowed to run inside Windows SharePoint Services. You can reduce this risk by examining the code of all assemblies to be placed in the Global Assembly Cache, including those from third parties. It is better to err on the side of caution than to risk the health and stability of your farm. To deploy the assembly to the Global Assembly Cache, open Windows Explorer and navigate to the C:\Windows\Assembly folder. Then, drag your DLL file into the folder, and it will automatically be added to the Global Assembly Cache. If you previously added your assembly to the Global Assembly Cache, you must restart IIS before your assembly will be recognized by Windows SharePoint Services. To restart IIS, open the Run dialog by clicking Start and choosing Run. Type iisreset into the Run box, and click OK.
To deploy the ACTIONS file, simply copy the custom.ACTIONS file to the C:\Program Files\Common Files\Microsoft Shared\Web Server Extensions\12\TEMPLATE\1033\Workflow folder on the server. Windows SharePoint Services monitors this folder for files with the ACTIONS file extension and uses the information inside to determine which actions to display in SharePoint Designer and how to display them. Finally, you need to update the web.config file to allow SharePoint Designer to use your custom action. Be aware that code running in the Global Assembly Cache runs without code restrictions and that updating the web.config file will enable this code to run inside Windows SharePoint Services. 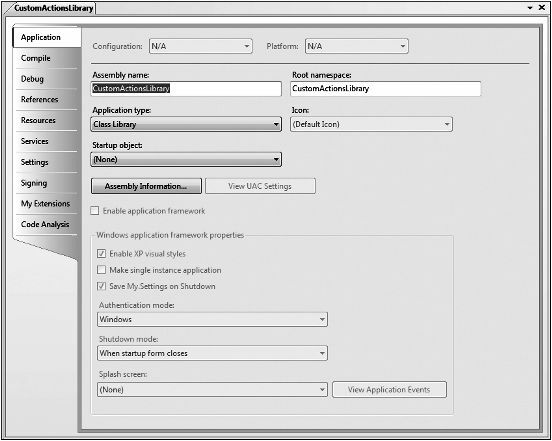 Be careful about which assemblies you add to the Global Assembly Cache and which of those assemblies are allowed to run inside Windows SharePoint Services. Back up your web.config file. If you misconfigure the web.config file, your SharePoint site will not function until you correct the file. The default location of the web.config file is C:\inetpub\wwwroot\wss\VirtualDirectories\portnumber\web.config, where portnumber is the port number of your SharePoint web application. Locate the tag named <System.Workflow.ComponentModel.WorkflowCompiler>. Use the same value as the Assembly attribute of the Action element in your ACTIONS file. Note that the PublicKeyToken value for your assembly will be different from the one in this example. A list or document library. A workflow in SharePoint Designer that uses your action and is attached to the list or document library. A list item or document in the list or document library. Because it is easier to test using a custom list, create a custom list by opening your browser and navigating to your SharePoint site. Choose Create from the Site Actions menu. If you cannot see the Site Actions menu, log in to the site as a site owner. 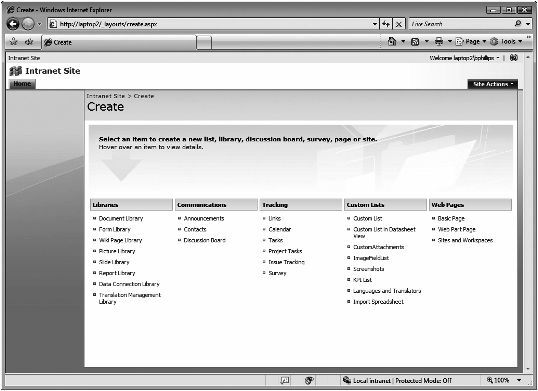 Once you click Create, the Create page is displayed (see Figure 15-13). Depending on your edition of Windows SharePoint Services and optionally installed features, you may have more or fewer options displayed on the Create page. Choose Custom List under the Custom Lists column. 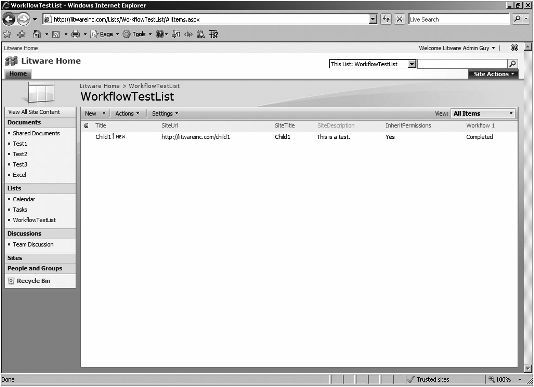 On the New page, enter WorkflowTestList as the name of the list, keep the default values for the other controls, and then click Create. The All Items page is displayed. Select the Plain Text option. 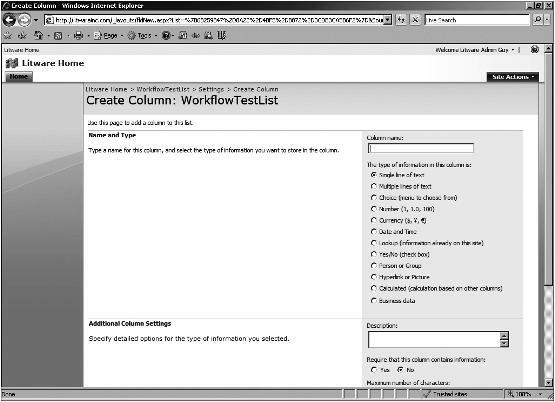 Now that you have created a test list, open SharePoint Designer to design a workflow that uses it. Allow this workflow to be manually started from an item. Automatically start this workflow when a new item is created. 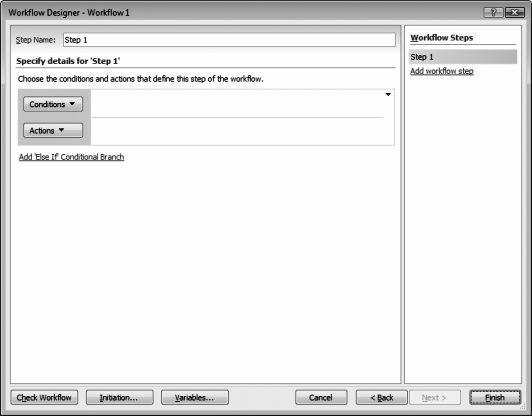 On the next Workflow Designer screen (see Figure 15-16), enter Step 1 for the Step Name. Then, click the Actions button, and select More Actions from the list that appears. When the Workflow Actions dialog appears (Figure 15-17), choose Custom Actions from the Select a Category dropdown list, and your custom action will be displayed. With your custom action selected, click Add. Now that your custom action has been added to the step, you can configure it by clicking each underlined word, clicking the fx button, and choosing the appropriate field from the list you created (Figure 15-18). After your action is configured (Figure 15-19), click the Check Workflow button to check your workflow for errors. Finally, click Finish to save your workflow to Windows SharePoint Services. 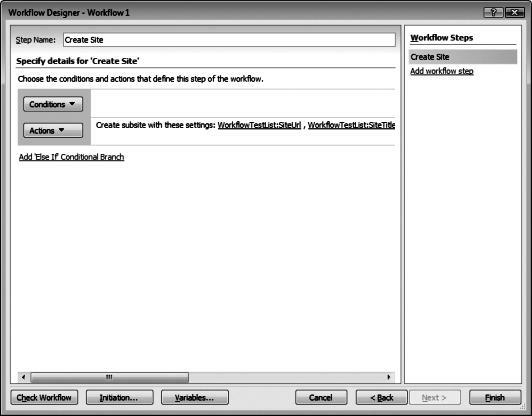 The workflow created in this section is a very basic one used solely to test the custom action. Normally, the custom action would be used as a part of a comprehensive workflow that could include sending a notification to the site collection administrators and requesting approval of the new site before it is created. 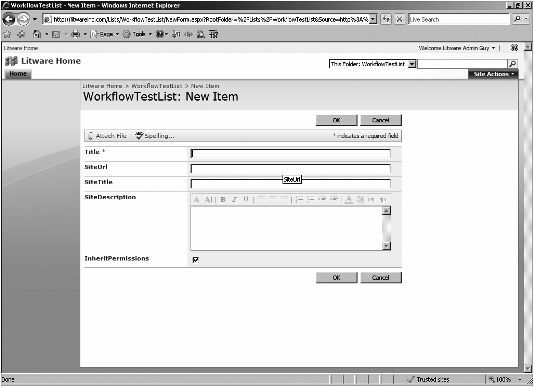 You configured your workflow to start when an item is inserted in the WorkflowTestList list, so navigate to the list and click the New menu item. On the New Item screen (see Figure 15-20), fill out the fields and click the OK button to return to the list. 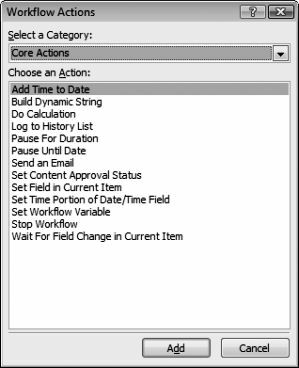 Windows SharePoint Services automatically starts your workflow and adds a new column to the end of the list to display the workflow's status for your list item (see Figure 15-21). Initially, your workflow will show a status of In Progress. If the workflow completes successfully, the Workflow's status changes to Completed; otherwise, it changes to Error Occurred. To verify that the site was created, click the Sites link from the Quick Launch bar at the left, and then click the name of the site on the All Site Content Page to navigate to the newly created site. During the process of creating, deploying, and using your action in SharePoint Designer, you can encounter various errors. This section explains how to resolve the most common errors. Error: Your custom action does not appear in SharePoint Designer. Ensure your custom ACTIONS file has been deployed to the C:\Program Files\Common Files\Microsoft Shared\Web Server Extensions\12\TEMPLATE\1033\Workflow\ folder and that you have restarted IIS. Error: You have updated your custom action, but the workflow does not appear to use the updated version of the action. Ensure that you have added your assembly to the Global Assembly Cache and that you have restarted IIS. Error: Your workflow passes validation after clicking the Check Workflow button, but not after clicking the Finish button. Ensure that you have added your assembly to the AuthorizedTypes section of the web.config file and that your assembly's strong name is correct and matching the strong name you configured in the ACTIONS file. With SharePoint Designer custom actions, you can greatly extend the power of custom SharePoint Designer workflows. Additionally, these custom actions are reusable and, once deployed, can be used across all sites in your SharePoint farm. Business process automation is very popular these days, and by creating domain-specific custom actions, you will arm your SharePoint Designer users with the tools they need to maximize the workflow capabilities of Windows SharePoint Services.